Housing for General Officers--to be worn over the saddle; of dark blue cloth, trimmed with two rows of gold lace, the outer row one inch and five-eighths wide, the inner row two inches and one-fourth; to be made full, so as to cover the horse's haunches and forehands, and to bear on each flank corner the following ornaments, distinctive of rank, to wit: for the Major-General Commanding the Army--a gold-embroidered spread eagle and three stars; for other Major-Generals--a gold-embroidered spread eagle and two stars; Brigadier-General--a gold-embroidered spread eagle and one star. 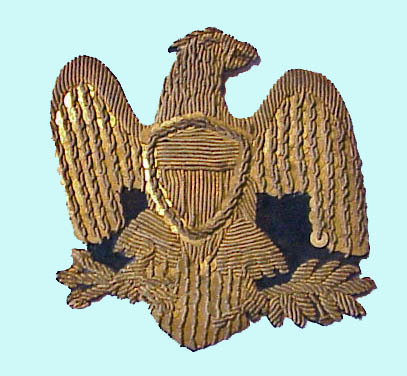 The above eagle of gold bullion embroidery is an example of an eagle sewn to the saddle cloth. It would be associated with one to three embroidered stars depending on the general's grade, but I do not have an example of the star. The period Schuyler, Hartley and Graham Illustrated Catalog shows a six-pointed star for the saddle cloth. The photograph of General Sherman shows the saddle cloth in use and illustrates the placement of the eagle and two stars for the rank of major general. 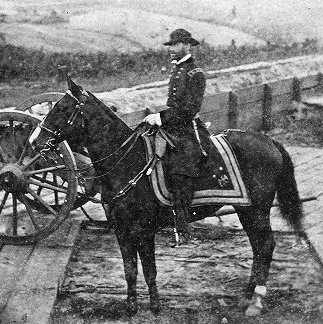 The term schabraque (various other alternative spellings) was applied to a saddle cloth such as Sherman is using in the photograph. It was employed by European armies and did have insignia indicating the rank of the user in the French Army. They were widely employed by mounted officers of U.S. Army until General Orders Number 13 of August 15, 1855 discontinued their use for all but general officers.